In this article, we will show you, How to Format Power BI Scatter Chart with example. This includes changing the scatters (Circle Shapes), Colors, Scatter Chart Title text, Title position, X and Y Axis Details, Data colors, and background Images etc. To demonstrate these formatting options, we are going to use the Scatter Chart that we created earlier. Please refer Scatter Chart in Power BI article to understand the steps involved in creating a Scatter Chart. 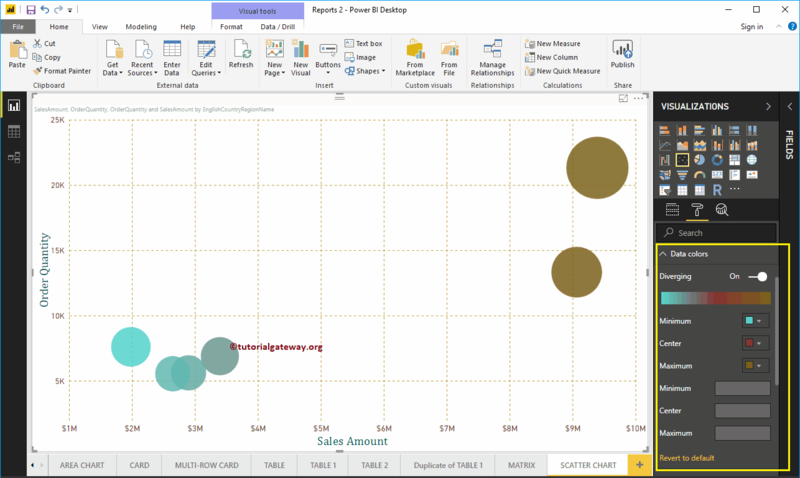 Please click on the Format button to see the list of formatting options that are available for this Scatter Chart. Following are the list of options that are available for you to format the Horizontal axis or X-Axis. Here, you can mention the Start and End Value. As you can see from the below screenshot, we change the Color to Brown, Text Size to 19,and font family to DIN. Let me change the Axis Title from SalesAmount to Sales Amount, Title Color to Green, Font style to Cambria, and Font Size to 25. As you can see, we changed the Y-Axis starting value to 2000 and End value to 25000, labels Color to Brown, and Text Size to 18. Let me change the Y Axis title from OrderQuantity to Order Quantity, Title Color to Green, Text Size to 24, and Font family to Cambria. Here, Here, we also changed the gridlines color to gold, and line style to dashed. While we are creating this scatter chart, we added the Sales Amount as the Color Saturation, and that’s why we are seeing the Diverging option under the Data Colors. Please change the Minimum, Center, and Maximum colors as per your requirements. 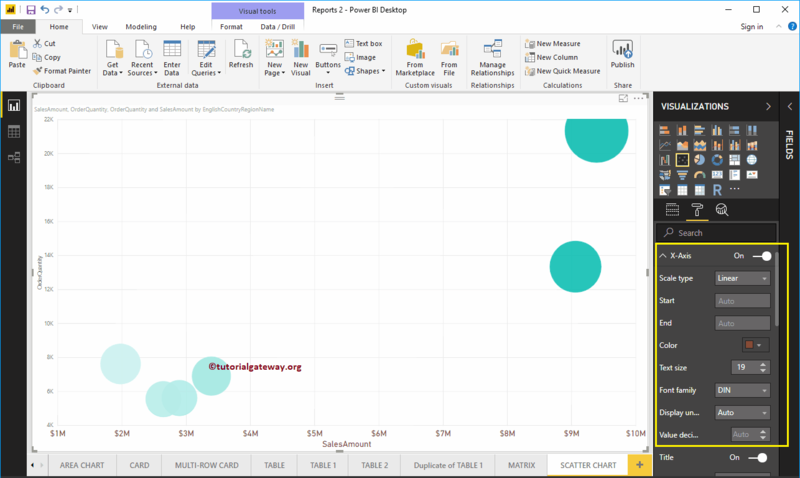 Use this section to change the Scatter Chart default Circles. As you can see from the below screenshot, we changed the Marker Shape to Diamond for demo purpose. 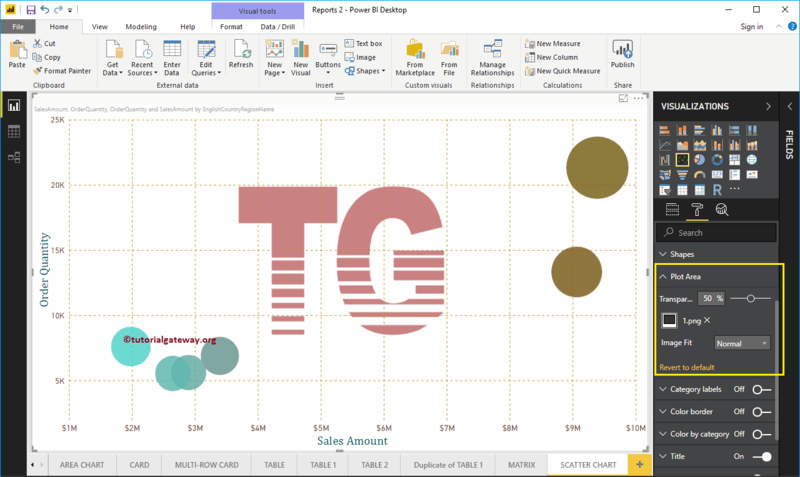 Using this Plot Area property, you can add custom Images as the Background of the Scatter Chart. For the demonstration purpose, we added one image as the Plot Area Background. Category labels means names that represent each circle. By toggling the Category labels option from Off to On you can enable these labels. From the below screenshot you can see, we change the Color to Purple, Text Size to 15, Font Family to DIN. If you want, you can add the background Color as well. By toggling the Color Border option from Off to On you can enable borders to the Circle (or whatever shape you selected). By toggling the Title option from On to Off you can disable the Scatter Chart title. From the below screenshot you can see, we change the Title Text to Sale Amount, and Order Quantity by Country Name, Font Color to Green, Text Size to 25, Font Family to Georgia, and Title Alignment to center. If you want, you can add the background Color to the title as well. You can add Background color to a Scatter Chart by toggling Background option to On. For the demonstration purpose, we added yellow color with 40% transparency. Similarly, you can add Borders to a Scatter Chart by toggling Border option from Off to On. 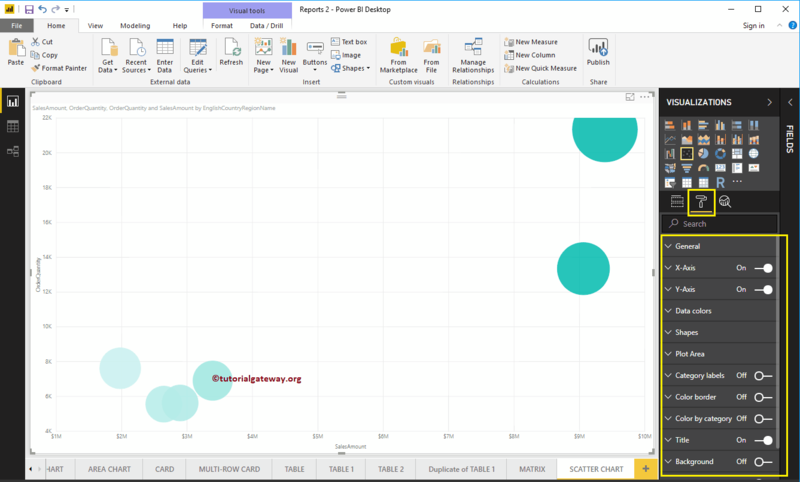 If you designed your scatter chart without placing any measure value in the Color Saturation Section then Data Colors section will show you the following options. By default, it will select some random colors but you can change them as per your requirements.